Marine scientists face particular challenges because working under water is costly and difficult. Remote observations of the seafloor using geographical information systems (GIS) are also limited. This is mainly because satellite images and aerial photographs, which are so important in studies of the earth's surface, have limited use for studying the environments of the seafloor. Nonetheless, there is a growing need for mapping and monitoring marine environments, for coral reef conservation programs, salvage, diving, marine archaeology and other exploration and environmental management purposes. Scientists at the Department of Marine Biology at the University of Oslo, Norway wanted to empower institutions in developing nations and sought to develop a system that was low-cost and reliable. The data collection software they chose was Windmill. They did this because Windmill was easy-to-use, low-cost, came with excellent user support and could log data from GPS receivers, echo-sounders, salinometers, water quality meters and many other instruments all to one file. Windmill runs under Windows and can log data from almost any instrument with an RS232 port. It allows a GPS receiver and an echo-sounder to be plugged into a laptop computer and automatically record the position of the boat and depth of water beneath it. The data can be imported into almost any PC mapping software, and maps plotted instantly on the laptop. Other information—such as temperature, salinity and current flow—can be collected at the same time and accurately superimposed on maps of the sea-floor. Each reading is time-stamped to within 100th of a second. Using simple synchronisation techniques, video camera evidence can also be incorporated. with a very clear dominance by branching, massive or tabulate coral. comprising tens of thousands of manual seabed evaluations based on video recordings posted on the maps. EcoScience Consultants Malaysia and Marine Parks of Terengganu, courtesy Head of Marine Parks in Terengganu, Ab Rahim Gor Yaman. The mapping system is currently being used in a collaborative project between the University of Oslo, EcoScience Consultants and Malaysian Marine Park authorities—for mapping the coral reefs of Payar, Perhentian and Redang Marine Parks in Malaysia. A coral-reef area of 114 hectares has been video mapped in 6 hours, achieving reef mapping rates previously only possible with airborne imaging devices. However, this system results in ground-truthed data and provides detailed bathymetric information that air-borne sensors do not provide. The system has proved itself as a stand-alone reef mapping and classification tool on a scale of tens to hundreds of square kilometres. Windmill sofware has enabled, the Malaysian authorities to successfully adopt high-quality and cost-effective marine survey methods for management and conservation. Scientists map the distribution of sea anemones and clownfishes in Malaysian Marine Parks, in a model study of effects of habitat fragmentation on marine biodiversity. 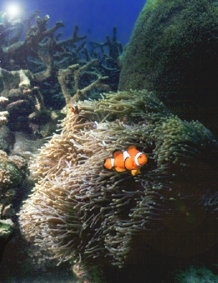 Anemone locations are eventually posted on sea-floor maps produced with the help of Windmill software. The Windmill system offers low-budget scientists a financially viable option for rapid mapping of both bathymetry and habitat characteristics of the sea-floor. It is also useful to SCUBA divers, sailors and anyone wanting to map a shallow (less than around 30 m) area of water. The results of the Malaysian study (published in Hydrobiologia 474(1): 67-79) demonstrate that automated Seafloor mapping has become available for anyone with access to a sonar, GPS and a laptop PC. For details of connecting a GPS receiver to a laptop, see our GPS page. We have also provided a Guide to Automatic Seafloor Mapping. A review of the system is at GIS Cafe.